Lock in a great price for Radisson Blu Resort & Spa – rated 8.6 by recent guests! All employees were very friendly and professional. Check in process fast and very easy. Rooms clean and housekeeping staff very polite and friendly. Dinning room staff very friendly; breakfast buffet fairly good. I would say better than expected in 4 star hotel. The room and balcony size, the sea view, friendly staff and a superb breakfast buffet. The facilities at the hotel were great, and the service eg down at the beach, by the pool was very good. I had a really nice massage and treatment in the spa, and the room we had to stay in had a beach view and was a really good size for me with two teenage children. The breakfasts in terms of choice and quality were excellent. An excellent hotel, would definitely go back. Staff always very attentive and helpful. Available but never intrusive or pretentious, as can sometimes happen in 5 star hotels. Nice spacious bedroom with all the necessary mod cons. Nice beach nearby, a few minutes walk from the hotel. The restaurant deck was so beautiful. Loved the seating area! So the property itself overlooks the Adriatic Sea, which provides the most gorgeous view. The rooms are very comfortable and the size is pretty decent. There was a balcony in my room which was nice to have. The hotel is a resort, with wonderful pools, bars, spa and restaurant. I wish we had more time in Croatia, I really enjoyed this resort. Absolutely gorgeous. Lovely breakfast, the beach club is great to relax at during the day - we weren't a massive fan of the pool as it overlooks building works! Location is about 10 min taxi to centre of split. We were very impressed with the room size and comfort, it was much more luxurious than other hotels we looked at in the area. Radisson Blu Resort & Spa This rating is a reflection of how the property compares to the industry standard when it comes to price, facilities and services available. It's based on a self-evaluation by the property. Use this rating to help choose your stay! One of our top picks in Split.Radisson Blu Resort is set a few feet from the beach and 1.6 mi from Split's UNESCO-protected Diocletian's Palace. It offers a luxurious Spa Center, while the outdoor pool is surrounded by sun loungers and parasols. 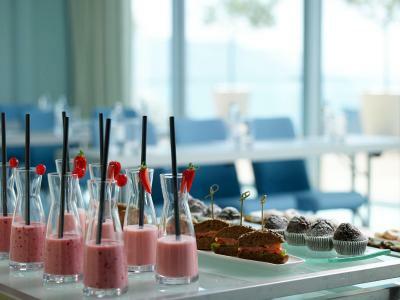 A modern restaurant and a lounge bar are at guests' disposal, as well as free Wi-Fi. Most rooms include a balcony with views overlooking the islands of Brač and Šolta. All rooms are fitted with air conditioning, flat-screen TVs and offer private bathrooms with free toiletries. Room service is available. The lavish spa offers various amenities such as saunas, massages and steam bath and Finnish sauna. The resort also offers an indoor pool. There is also a gym at guests' disposal. Conference rooms are available and concierge service is offered at the Radisson Blu. 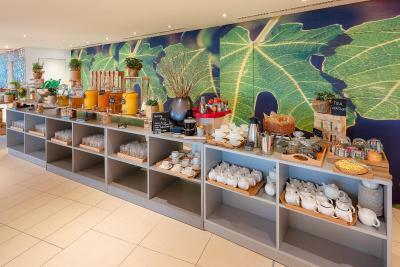 The Fig Leaf restaurant serves the Radisson Blu Super Breakfast Buffet. It includes a wide variety of breakfast dishes. You can also enjoy your meal on one of the lovely outdoor terraces. Aperitifs, cocktails as well as nonalcoholic beverages are served in The Door Bar. When would you like to stay at Radisson Blu Resort & Spa? This junior suite contains a bedroom and a private balcony with sea views. It comes equipped with a walk-in shower and bathtub, a Nespresso® coffee machine, as well as bathrobes and slippers. Guests also have free use of the Spa and Wellness Center. Please note that an extra bed is available for the 3rd person. Private parking is available on site (reservation is needed) and costs EUR 13 per day. Boasting impressive views of the Adriatic Sea and the islands from its balcony surrounding the entire room, this spacious suite provides access to the Wellness & Spa area. Please note that an extra bed is available for the 3rd or 4th person. This double room features city views. It comes equipped with a flat-screen TV, bathtub or walk-in shower with bathrobes and slippers, and provides complimentary access to the wellness & spa area. This double or twin room features a private balcony with city views. It comes equipped with a flat screen TV, bathtub or walk-in shower with bathrobes and slippers, and provides complimentary access to the Wellness & Spa area. This room features a private balcony with sea view and comes equipped with a flat screen TV, walk-in shower or bathtub with bathrobes and slippers. This suite features a large terrace with sea views. It comes with a flat-screen TV and provides complimentary access to the wellness & spa area. The premium room was completely refurbished in May 2018. This suite features a large terrace with sea views and comes equipped with a flat screen TV, walk-in shower or bathtub with bathrobes and slippers. The premium suite was completely refurbished in May 2018. 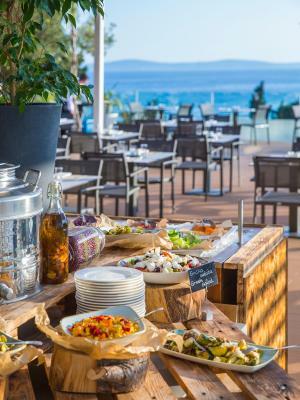 Located along the stunning, crystal blue Adriatic Sea, the Radisson Blu Resort, Split is an oasis offering a beautiful pebble beach, two pools, three restaurants and four chic bars. This Adriatic seaside hotel in Split boasts 252 modern, stylish guest rooms, including 39 suites and two exclusive Presidential Suites. House Rules Radisson Blu Resort & Spa takes special requests – add in the next step! Radisson Blu Resort &amp; Spa accepts these cards and reserves the right to temporarily hold an amount prior to arrival. Radisson Blu Resort & Spa accepts these cards and reserves the right to temporarily hold an amount prior to arrival. Beds are quite hard in the rooms, not the best comfort. Pillows not very supportive. The quality of the treatments I had at the spa did nowhere near meet the high cost of them, otherwise they'd be acceptable. Full body massage was not full body, facial massage was told neck massage involved but not received, and treatment room was cold so very unenjoyable & unrelaxing. Rooms are well appointed. Spa area with sauna & spa are excellent! Excellent facilities !! Good location.. lots of Lovely staff. The booked junior suite room had huge stains on the carpet. We didn’t find any problem, all good! The breakfast buffet, the room, the spa... The view was really nice and the wifi was working without any problems! Service at the dining room could be better, there are too many young staff but they need better guidance. I understand that terrace is not ready for use, but guests are taking out their food as they like having breakfast at the sun and nobody is cleaning the balcony at all. Sometime you see buffet servers standing and doing nothing, or rushing to take one plate from table, but no one told them that balcony is also area that need to be looked after, even if it is not officially opened. All tables are dirty, with glass marks or full ashtrays, even during the afternoon hours when bar is open. Quality of deserts was very poor. The fact that you need to pay for the parking even if you are the hotel guest! 13 euro a day! On our check out day, one of the staff members came to check on the minibar, bringing additional drinks and food to put into it, at that moment it wasn’t really the best time for us to let him in which I showed him by asking if it could wait, but it looked like he didn’t really care and didn’t even ask if he is bothering us, just wanted to complete ‘his mission’ and go. The room was big enough, clean, with amazing sea view. 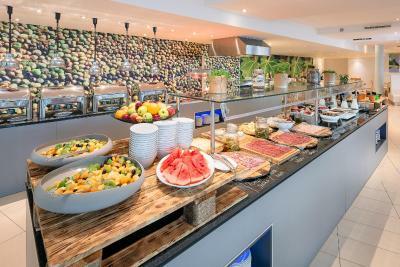 Breakfast was very good, the staff at the reception was helpful and customer oriented. Hotel is close to the Split Riva which is also a bonus. I cannot name a thing. Maybe the wifi and the internet connection could be faster that's not a showstopper for the hotel. The breakfast and the view from the Fig restaurant was very good. The spa and gym is good to have at the place. The sauna and steam bath is superb. Great food for dinner also available in the hotel. The bar also good. The staff is superb and helpful.